It turns out that sweet potatoes and yams that we find here in the States are really all sweet potatoes. What we think of as yams are called this by mistake. It started long ago when the slaves were brought over and identified sweet potatoes with the “nyami” from Africa. The name stuck and we’ve been eating a misnomer ever since. To further the complication, neither of them are really potatoes at all! They are both tubers, although not even related to each other. In fact, the sweet potato is a cousin of the morning glory flower. There are about 200 varieties of true yams, of which none grow in the States. They are all different colors and sizes, the largest measuring almost 7 feet!!! I was so hoping to find one of those. Still confused at which one to use for Thanksgiving, we set off to find out what the differences are and how they will effect your recipes. I’ve baked, boiled, sauteed, mashed and grated them both, but until now I didn’t really know what I was dealing with. Our journey started at an Asian Market called Shuang Hur on Nicollet Avenue in Minneapolis. They had bins filled with things that looked like sweet potatoes or yams, sort of. They weren’t orange or tan like I am used to seeing, but the shape suggested a relationship. They were black, white, red and some had rough, even “hairy” skins. The bins weren’t market so one of the employees acted as our guide through this exotic produce aisle. It turned out they were authentic yams, not sweet potatoes at all. We bought a bunch and I headed home to bake them along with some sweet potatoes and “yams” I’d bought at Whole Foods and my local coop. From top: Camote (sweet potato), Purple “ube” Asian Yam, Sweet Asian Yam, Yampi Yampi, Jewel “yam” (sweet potato), Sweet Potato, Garnet “yam” (sweet potato). In order to taste all of the varieties on an equal playing field we baked them. I like baking sweet potatoes and yams over boiling because it caramelizes the natural sugars and makes them more intense. These sweet tubers are not only tasty and beautiful but they are also packed with vitamins A & C.
Here is the flesh of the sweet potatoes. Both Ochen and I thought that the Jewel “yam” was the sweetest, then the Garnet “yam”, the Camote and finally the sweet potato was the least sweet of the bunch. These are the authentic yams that we found at the Asian market. The purple “ube” yam was the sweetest of all the yams, sweet potatoes and fake “yams!” Its color was disarming and like no other natural food I’ve ever seen. It was delicious and I will definitely be buying more. The color alone had me, although I was disappointed in how it baked in the pots de creme (below). The Yampi Yampi was dry and mealy and not at all sweet. The sweet “yam” was creamy and sweet, but not compared to the purple yam. This one I have in “” because I couldn’t find any information on it and wonder if it isn’t a sweet potato?? If you know please tell me! 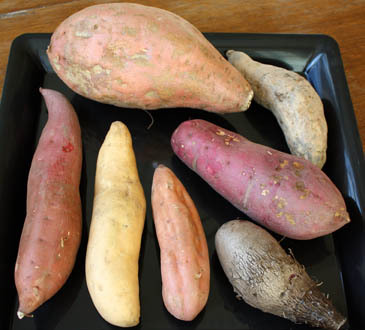 Our next experiment was to bake the different “yams,” sweet potatoes and real yams in a recipe. I was curious if the differences we detected in the plain baked version would hold true in a dish with other flavors competing with it. In a heavy bottomed pan gently heat the cream with the ginger, cloves, cinnamon, vanilla and brown sugar. Allow to gently simmer and then turn off heat. The longer you allow the cream and spices to steep the more intense their flavor will be. This can even be done the day before. When ready to prepare the custard strain the spices from the cream. Add the yolks, honey and mashed sweet potato to the cream. With an Immersion Blender or whisk blend everything together very well. I like to use the immersion blender because it further breaks up the potato. If you are not using one, you might want to strain the custard before putting in the cups and baking. Bake as I did for the Chai pots de creme recipe. Neither Ochen nor I could detect any difference between the pots de creme using the different varieties of yams and sweet potatoes. The color of the purple yam mixed with the egg yolks turned the whole thing a tinge gray and it had the slightest graininess to the texture, so I’d not use it for this again. For the second recipe I decided to use grated sweet potatoes and yams to see if the flavor would be enhanced. Otherwise the list of ingredients are quite similar. The result was surprising. Unlike the pot de creme we really could taste a difference between the different varieties and it wasn’t all that subtle. I guess leaving it raw and coarsely grated made the difference. This is an old recipe for sweet potato pudding that is meant to be served with whipped cream spiked with Jack Daniel’s whiskey. It is important that all the ingredients are at room temperature. Cream together the butter and sugars until well blended and very light. Beat in the eggs; beat in the spices and salt. Stir in the sweet potato or yams; add the milk and mix thoroughly. At this point the mixture may appear to separate, but proceed because it doesn’t seem to effect the finished pudding. Bake until set, about 25-30 minutes. Cool to room temperature and serve with whipped cream that you spike with Jack Daniel’s. I tended to like this pudding made with the sweet potato and Ochen liked with best with the super intense purple yam. You try and decide with you like best! Here are more recipes to make with sweet potatoes or “yams” or real yams! has a recipe for spicy Sweet Potato Chaat that will make you weep. A Southern baking bible Biscuits, Spoonbread, and Sweet Potato Pie by Bill Neal has amazing recipes for Sweet Potato Pie and Biscuits. Irene Sax wrote an article recently for Saveur magazine with a classic Sweet Potato Casserole. Finally the quintessential candied “yam” recipe from Mark Bittman’s How to Cook Everything , albeit a healthier version. Jeff and I have also been working on some recipes for our follow up book to Artisan Bread in Five Minutes a Day that include sweet potatoes, maybe now I will throw in a yam recipe as well? Due to the fact that I now have about 10 pounds of baked sweet potatoes and yams my family is eating them with everything. I just made a Sweet Potato Milk Shake that I just have to share with you. Mix well in a blender and split between 2-4 cups. Seriously fabulous, like a cold creamy sweet potato pie! Wow, what great info. I’ve always wondered what the difference is. So basically, a yam is a sweet potato and vice versa. Absolutely fascinating! I was actually wondering about this very recently… Thank you so much for clarifying things a bit. Yes, all of the sweet potatoes and “yams” we buy here in the States are all sweet potatoes. So you are a chef, a writer, a sculptor, a photographer, and definitely a scientist, too! (and more, I’m sure) You make the whole journey sound so fun… Thank you for sharing your findings with us!!! Thank you for explaining all this. I have always wondered what the difference was and I thought I was one of few who did not know b/c I spent half my life outside the US. Haha. That is really interesting. I really want to try a purple yam, I hope my Whole Foods has them. what a great post on the yam/sweet potato debate! I too like the purple yam. I always buy it at the Asian market. Really interesting recipes incorporating them too! vegestables in cooking. But you didn’t say which you prefered. I want to know which one. For the pudding I preferred the sweet potato, because the recipe is already quite sweet and the other two options made the pudding cloying for me. Ochen, however, liked the sweeter version! What a fantastic experiment! Thank you for sharing this. Did you happen to find a Japanese sweet potato? Thanks for such an informative post. This is the first time I’ve seen someone do sweet potato pots de creme…but none came out better than the others? i have never seen a purple yam before!!! i’m so jealous!! i’m gonna go to whole foods and look for one. Holy cow, wow. And some gorgeous pictures for this yammy rendezvous! Great job! No Japanese sweet potatoes (or are they yams?) on this trip, but I’m now on a mission to try as many varieties as possible. I’ll make it with the Jewel “yams” because of the color. The purple yam was our least favorite for this recipe, although we loved it in other things! You may need to seek out an Asian market to find the purple yam?? My whole foods only had the sweet potato “yams”. The purple yam is a favorite of mine. I’m Filipina so I know it as ube. This type of yam is used in a lot of desserts. I’ve had it in ice cream, cake, jam, breads and other treats. If you’re in the Asian market again you should definitely pick up some ube ice cream. It’s so good! Also, if you ever have the chance you should try an ube cake from the Goldilocks bakery (located in California and Nevada). I buy purple potatoes at Trader Joes all the time. They are delicious, and purple is my favorite color, so it “fits” in my kitchen decor. Purple mashed potatoes are disarming… but oh so delicious! I’d love to try the ube ice cream, I’ve read about it but have never tried it before. I’ll keep my eyes peeled for it. You will love these yams, the color is like nothing I’ve ever seen before! Sweet potato milkshake!? Zoe, you are my new hero. If these yams taste as beautiful as the photos, we are in for a treat! I’m going to try to find the purple ones. I’ve always wanted to incorporate more purple yams into our diet, but they’re so hard to come by around here! Love their purple color though, not to mention sweet flavor…they’re so disarming. Hi Maris, It really was delicious. My boys ran around the neighborhood talking about it, because I got some calls from moms wanting the recipe! LOL. Hey Chad, I can’t wait to try your new line of aebleskivers! I totally agree and will be eating a lot of purple food from now on! Hi, I was a little shocked when you came by my blog. I am so excited to have purchased your book, too bad I can’t have it autographed.lol. I love it so far and been to the main site. I guess you saw where I linked to send other to see your book. Nice to see you in picture and I going to look around your blog. later. Love the experiments and the posting of all the photos. Thank you. I grew three kinds of sweet potatoes this year, I’ll be on the look out for more kinds to grow -next year. Look at all those gorgeous colors. And they are nutritious and tasty too! HUH?? ?…I don’t think this clarified ANYTHING (as you can tell be reading the comments)…what is a yam vs. a sweet potato?…how many varieties of both are there?…your confusing “from the top” picture makes it worse! Sorry if you are still confused. There are certainly more profound studies on the subject available. I guess the bottom line is that for your Thanksgiving recipes or any other, it doesn’t really matter which tuber you pick! Yams do not have vitamin A like sweet potatoes. This is the market where I find the purple yams. You can call them and see if they will tell you where they get them??? i think i recognise the yampi yampi as a type of yam used for hakka chinese savory dishes. it’s cooked with fermented red bean paste and it turns out a little powdery and mushy. the purple yam is used for a type of teochew chinese sweet yam paste with gingko nuts. and as ann mentioned above, in south east asia it’s generally called an ube. Hi, I’m just wondering how you determined that your yam specimens are “authentic?” Is it b/c the market staff told you so? If so, I’d take that info w/a grain of salt, b/c I’m asian and I know many times the translation of the items at the asian markets are incorrect. I think almost all of the samples here are different varieties of sweet potatoes, except the hairy one in the bottom right corner of the 1st pic. The purple sweet potato you have is often called “Okinawan s.p.” or “Hawaiian s.p.”. I don’t know about yam greens, but s.p. greens are often eaten in Vietnamese cuisine. Growing up, my grandma grew the purple s.p. (although the pigment isn’t as deep purple as the ones sold at the market), and we’d often eat the greens. It is indeed hard to be sure but I think this purple yam is an “ube,” which is an Asian yam, not a sweet potato. But, like you said, I’m relying on the people at the market to tell me. Were the purple sweet potatoes that your grandma grew crazy sweet? This one tastes like I added sugar to it. Indeed the Purple “yam” you have photos of here is indeed an Okinawan Sweet Potato. They have light colored skin and are usually dimpled like the one shown, with purple flesh that is very dense. The Hawaiian Purple sweet potato looks very similar to the okinawan except the skin is very light, almost white and smooth (the lightest skin you will find on a sweet potato) with purple meat that is softer than the okinawan. The purple or ube yam (one of the several names for this yam) is the same color purple on the outside as it is on the inside. You would be hard pressed to find a purple yam in the US. Asian markets sell mostly Okinawan sweet potatoes and you may occasionally find Hawaiian Purple sweet potatoes. There is also an asian sweet potato with a burgundy skin and purple flesh. I have yet to find out the actual name for that sweet potato. In the store it just says “Asian sweet potato.” With over 1,000 species of sweet potato, sometimes it is hard to find out the actual name. The last place to ask about the name of sweet potatoes is Whole foods which labels all of their sweet potatoes as “yams” even though USDA requires sweet potatoes to be labeled as both yams and sweet potatoes (they started this confusion in the first place) and usually incorrectly labels the variety incorrectly as well. My best recommendation for people is to learn their sweet potatoes by skin color and flesh color. Taste and find out which ones you like and buy them at the store based on visual ID because you will find your favorites and you will see them named something different everywhere you go. Hello, thanks for the article it was great to find someone that addressed this. I live in Mexico and have found what I believe is the Asian Sweet Yam, can you tell me the interior color of this? 2nd) If you were to look at the nutritional facts for a sweet potato vs a yam on any given US nutrition website it shows two different nutritional facts. So are they actually showing the nutritional facts for an American Yam (SP) and a “white” sweet potato or are they using actual yam vs sweet potato. I live in Hawaii where we have an abundance of “yams” and “sweet potatoes,” due to the wonderful mix of Pacific Island, Asian and other cultures. The purple “yamtato” 🙂 you have pictured is called Okinawan Sweet Potato in Hawaii and is made into wonderful desserts. Most famously is the haupia (coconut) sweet potato pie. I recently had a dish that was Okinawan sweet potatoes and bananas. It was like a very thin pudding. Babies in Hawaii love mashed Okinawan sweet potatoes and older keiki (children) like Okinawan sweet potato fries. I found this searching for recipes for some purple yams (ube) that I accidentally bought at the Farmer’s Market. Great info and I won’t return them now that I know how good they are! I think it would be useful to people who stumble upon your page in search of a definitive resolution of the puzzle (“what’s the difference ..?”) if you updated your main text and picture captions to point out which (if any) of your illustrations is a true yam. And perhaps even to emphasize it, to comment [if correct] that unless identified as true yam, most of your examples are sweet potatoes even if they are commonly called/labeled yams. Nevertheless, thanks for the interesting article. I’ve gotten that feedback before and will try to redo the photo at some point to make it clearer! I thought that they are not yams but sweet potatoes, too. But that’s not important as long as you know what you are looking for. For me, I have learned how many kinds available out there and what they can be made into. Foodista Blog - Sweet Potatoes or Yams? I’m so glad you cleared this up for me. I’m 67 and when I was young sweet potatoes were red and narrow. Yams were rotund and yellowish. To my mother it was clear. Then suddenly I woke up one day about 30 years later and suddenly those little thin sweet red tubers were labled “Yams” in the store. And Sweet Potatoes were rotund and yellowish. I knew something was seriously amiss but I just didn’t know what. Thanks for straightening it all out for me. It’s really nice to know the difference in all of these! To be completely honest, I wasn’t aware that there was a difference in a yam and sweet potato, I thought they were interchangeable. I’m so glad the great debate is clarified! And to answer your question, I use a different one every year! So… what’s the difference? Which is which? I did a search on Google for the difference, this blog was one of the top returns, but this doesn’t really tell the difference between them. Lovely photos, though, and I like the recipe offerings. Great article, I can’t think you enough for clarifying all this. BTW, Cooking sweet potatoes in a pressure cooker is fast and brings out the flavor, too. Fabulous info and recipes! Thanks! Hi, This particular topic has been a discussion in our home for many years. The “sweet yam” you have pictured above is something I grew up on and still enjoy to this day. I was born on the Island of Terceira Azores, Portugal and there they call it “Batata doce,” which translates to sweet potato. We live in Plymouth, Massachusetts now and we are only able to find this particular yam in portuguese stores in the New Bedford and Fall River area. In these stores it is labeled sweet potato or japanese yam. Hence the ongoing discussion of what it is actually called. This yam has it’s own distinct taste it is extremely smooth and sweet and wonderful. It’s sweetness is intensified, the closer you eat towards the center of the yam. In portugal they call it the heart of the yam. When sliced in half you can see a slight color difference from the outer edge to the more concentrated center. In our family we boil them w/ a pinch of sea salt and serve peeled with a drizzle of olive oil. We also make a hearty vegetable kale soup and serve it with a few slices of this yam to top off the bowl. We also slice it and pan saute in a bit of olive oil, until a carmelization takes place and accompany it with eggs for breakfast or a wonderful fresh piece of broiled fish for dinner. Simply delicous! Thank you so much for the note. You have me craving yams again! This is pretty thorough explanation of the differences between sweet potatoes and yams. You did a fantastic work with all these researches and experiments. Great! For me, purple yam is still the best among these sweet potato varieties. Thank you for writing about this in plain English (with pictures!)! This is something that has always bugged the hell out of me. I love sweet potatoes and became intensely confused when I moved out of Obscure, PA to Koreatown in Los Angeles where the variety of sweet potatoes opened up for me. The Sweet “Yam”, as you called, it is a Korean Sweet Potato. It is indeed a sweet potato and one of my favorites but I have not had the chance to try some of the more exotic varieties you experimented with. To my overwhelming delight, these are very common in Los Angeles. There are even coffee shops that use it in their specialty drinks. A popular Korean coffee shop called Heyri has a “Sweet potato latte” that has over-boiled sweet potato with milk and sugar. Freakin’ delish. Sadly, I’ve moved from LA to South Carolina where the traditional Jewel Yam is everywhere (and cheap at .35 cents a pound!) but not a single Korean sweet potato in site! I am trying to locate a place that sells seeds for the Korean Sweet Potato variety so I can keep that last vestige of LA closest to my heart and on my plate! Great site, Zoe. Keep up the amazing work! That’s not ube. That’s purple sweet potato, also known Okinawan purple sweet potato. This has been very insightful. I’ve worked in a produce department for 5 years, and was never questioned about a “true yam” until today. Therefore did not know there was such a huge difference between yams and sweet potatoes. I am going to have to go search out this Shuang Hur Market being that I live here in Minneapolis. And I am very excited to try some of these recipes! Thanks! Love all the testing you’ve done. On thing I noticed is the “yampi yampi” I believe is called a yuca or cassava in latin america the carribien and Africa. It is use to make sago or Tapioca pearls. I believe from the research I have done on it is a tuber or ube. Thanks for the clearing up of the sweet potatoe vs yam issue. This is the most outstandingly written article on the differences between yams and sweet potatoes I’ve read. Thanks for taking the time to detail it out and for providing the photographs, they helped to clarify. Thanks for the great discussion. Every Thanksgiving our family has a discussion on yams vs sweet potatoes. Now we know our yams are sweet potatoes. Our relatives from the south we eating ” American yams”. There is one item (a couple) still for discussion. The sweet potato is from South America, “American yams” too. Wikipedia in its discussion of the origin of yams and sweet potatoes says that in New Zealand they grow sweet potatoes brought to the islands by the Maori. Since they arrived in NZ 800 to 1,000 years ago, how did the Maori get the sweet potato? The Spanish would have only taken the sweet potato to Asia after the conquest of South America in mid 1500s? I’m from Mi and was told that what we get are yams not sweet potatoes you say the exact opposite of what the importer of the food says so …..
That is what my research found, but your store may actually have yams??? Thanks so much for doing this research–I now realize I’m not the only one confused about yam vs. sweet potato. My only concern: beta carotene content. I’ve read (accurate?) that yams have very little beta carotene content, while sweet potatoes have very high beta carotene content. I bought some camotes today at WFoods and feel confident I’m getting the higher beta carotene! Thanks! How many people/ramekins can you serve with the recipe for the Potato Pots De Creme? This seems to be the million dollar question. I have been told very different information about the purple yam/sweet potato. “From top : Camote…” Going *clockwise* or *counterclockwise*?! Just wanted to add what care2.com says about sweet potato’s and yams. Here is what I copied from there sight. Ok, now Im real confused are they the same or not? Real yams and sweet potatoes are not the same. Having said that, most of what we find here are sweet potatoes, even though they are called yams. All those dishes made at Thanksgiving are really made with sweet potatoes. There is indeed a true purple yam. However, that’s not what you found. Everything you experimented with, aside from the Yampi Yampi, is in fact a sweet potato cultivar. I’d guess that the “purple ube” was the okinawa cultivar. I’ve acquired, at this point, six purple cultivars, along with four asian yellow varieties, three central american golds, four orange cultivars (out of a few dozen avaialble), and two polynesian white cultivars. Aside from size, moisture, stringiness, and lumping, the differences tend to be delicate flavor variation, shape and flavor of the leaves, and color variation. Well, aside from one unnamed purple cultivar with deep purple skin and brilliant jewel purple flesh that smells like tahitian vanilla. True yams are a very different matter. I’ve encountered varieties ranging from potato-like to mushy to nearly chalk. They all have roughish skin on the tubers, at least among the varieties I’ve seen. There’s one that has edible nodules on the vine, and even a few that are more tree than vine. Yams should never be eaten right out of the ground, as some varieties are toxic until cured. Great addition to the yam vs sweet potato saga. Migration of the sweet potato has been tracked across polynesia, to new zealand, and eventually japan and the philipines, over the course of a relatively brief 200-500 year span. There is no archaeological proof regarding the point of contact between the natives of polynesia and those of south america – though this was the point of Kon Tiki, that wasn’t a scientifically rigorous demonstration – but the fact of the matter is, the natives of polynesia had a long history as navigators and explorers of the sea, while those of south america have no such recorded tradition. The likely scenario is, some group of polynesian explorers brought a few slips back from a voyage, and all of the sweet potato in polynesia, new zealand, japan, korea, and the philipines before western contact with the americas is descended from those slips. This is also consistent with the genetic diversity in the non-american sweet potato cultivars, in spite of their seemingly exotic diversity. I am trying to make sweet potato slaw for Mardi Gras themed Garde Manger buffet. My chef says I should cook the potatoes first so they don’t turn during service. Which sweet potato should I use or maybe should I go with yams? It can’t be a slimy, nasty mess of orangish-black mayo; my grade depends in it. You should use the bright garnet colored sweet potatoes (which are probably labeled as garnet yams in your grocery). You will need to cook them first or they will turn black and be way too starchy to eat. Don’t over cook them or they will be mushy. Another approach would be to make lacey potato pancakes with them. They may hold up better in that form. which on of the yams or sweet potatoes is high in starch or more carbs. since the yampi are out this season i have been enjoying them alot as a source of my carbs. Thanks! The ones on the picture that are actually labelled “sweet potato” and “Camote” are the best tasting ones. Those two are very hard to find. Those are the ones we eat in Liberia and they are very delicious. All the others ones with yam in the names are copy cats and they becomes very saggy, wattery and taste awful when you boiled them and they don’t qualified as sweet potato. Garnet yam is the most popular and taste like crap when you boiled it. Thank you so very much for your article. I have been wondering about the difference between sweet potatoes and yams. Upon learning that the produce offered at most grocery stores are all sweet potatoes, I then wondered about the difference amongst those. You’re article has thus far given me the most info. Thank you and your family!! Great reading! Are jewel “yams” the same as red yams? A lot of stores adverrise red yams? It is tricky to know if they are true yams. If you are finding them in a general grocery store, you are probably getting some kind of sweet potato and not a true yam. I think red or “garnet” yams are really sweet potatoes. can the purple yam hold together ,if boiled ,so it can be sliced and fried? I didn’t try it, but I do remember that they held together well and didn’t become mealy, so I think you will have success. Be sure not to over cook them when boiling. Sounds delicious! the orange sweet potato , i boil till almast done,with skin on. let them cool to peel them and slice them about 1/3 of an inch thick ,then fry them in butter till i get a crust on them. this is done on thanksgiving and about any other time i can get the chance, a very little shake of salt and pepper. Interesting FACTS of YAM or SWEET POTATOES?? or improve the description below the image? I can’t tell which ones from there turned out to look like the cooked and cut images – mainly because the cooked ones all appear to have purple skin. Thanks! Wow- a sweet potato shake – what a great idea. I’m going to try that. I came upon this site searching for info on the garnet sweet potato, which I recently tried and love it- I like it more than the lighter colored sweet potatoes. I found it in the organic section of our store – that could be another reason for the great taste. It was rich, sweet, and not pulpy or stringy. I think my next project should be to try to grow some. I don’t think I will ever try the purple sweet potato, or the white-ish anemic looking one. Those are not for the faint of heart! -:) Thanks for your column. Great photo comparison, I was wondering why my sweet potatoes bought at different grocery stores taste so different. You have solved all my questions! Thanks!! Big Like! I understand the Filipino Ube Yam (Purple Yams?) are dryer and not as sweet and is starchier, than the smooth firm textured thin-skinned Japanese Okinawan Purple Sweet Potato. Purple Okinawan sweet potato is often confused with the purple yam/ube. I’ve been looking for both in the market to take pictures of! Do you know how I can tell them apart? To confuse matters, in the U.S. a soft cooper/orange sweet potato is labeled a Yam! (The firm golden/light sweet potato (less sweet) is still labeled a sweet potato). A true yam (dark on the outside, white on the inside) isn’t often sold!